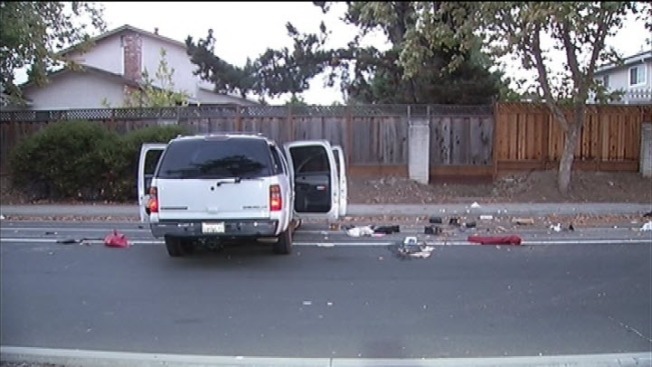 One suspect was hospitalized and another was at large Tuesday morning after San Jose police say the pair was involved in a car burglary and crash. Lt. Danny Acosta said a neighbor from the Almaden Valley neighborhood called to report a car break-in about 4 a.m. When officers were responding to that report, they stumbled upon another find: A Chevy Suburban -- also stolen -- had crashed into a light pole at Coleman and Merdian avenues. One suspect, a man in his 20s, was inside the SUV and taken to the hospital with serious injuries, police said. Another suspect is at large. Police said several vehicles were hit Tuesday morning. Police do not have any information on the other suspect they are looking for. Police are now interviewing witnesses in an attempt to piece the rash of burglaries together.